A few weeks ago, I posted on what we had saved for the first two weeks of our fridge-less project. I got some interesting responses! Some of which made me realize that not everyone who is a current browser on my blog fully understood what we were doing. I had a hair-brained idea to see if we could live without a refrigerator for a month. No reason. Not really to save money (though I knew we probably would). More like, I just wonder if we can? I got a lot of “I’d love to do that, but I can’t live without my [insert favorite cold food or drink item here]” comments. That was never the point of our experiment. More like the opposite. How could we unplug the fridge and still eat and drink all the things we like to have? I watched “No Impact Man” with my yoga class and we had a discussion afterwards about the movie and in particular the getting rid of the fridge part. Even though they were “saving electricity” in their apartment, they were using someone else’s electricity to procure the ice they were using, not to mention that spoilage was possible by not keeping cold foods at a safe temperature, especially considering they had a baby in the house. Most of us in the yoga class came to the conclusion that we *could* go for a time without a fridge – I’ve done it myself after several hurricanes for up to 3 weeks – but the energy that shutting off most new energy efficient refrigerators actually saves is often negligible.Your family saved approximately $4. You didn’t say in your blog post, so I have to ask: was $4.00 worth the extra trouble and inconvenience? So first, I want to talk about the inconvenience. Here’s what is currently in the “icebox” (the freezer compartment of our unplugged refrigerator): A gallon of milk, a quart of half and half, a half gallon of yogurt, four kinds of cheese, a tub of cottage cheese, lemon juice concentrate, fish sauce, homemade jam that’s a little too runny at room temperature, peanut butter (so I don’t have to stir it every time), green onions, grapes, a pound of butter, hoisin sauce, ginger, my bacon grease container, half a bottle of bleu cheese dressing, and mustard. Oh, and two one-gallon jugs of ice. Normally there would also be mayonnaise, possibly some orange juice, and usually some carrots and celery, but I need to go to the store. Meat for tonight’s dinner is defrosting on the counter. To keep all of this cold, I walk out to the chest freezer in the garage each morning (usually while I’m on my way to get chicken food) and swap the half-melted ice jugs for two completely frozen ones. I also grab meat for that night’s dinner and a pack of peaches or frozen veggies or whatever I’m going to use later in the day. Pretty simple, and we didn’t change our diet or menu at all. The only thing is that I now buy only one gallon of milk instead of two each week, or it will go bad too soon. I don’t go to the store more often, we just are drinking less milk (but this hasn’t been an effort, not sure how it’s working actually?). We did leave for the weekend at the end of May, and that entailed a bit of planning for the condiments we left behind, but it really wasn’t a big deal. Next, cost. From May 1 to May 18, we saved $0.31/day or $5.58 for the month compared to the previous year. That was 15.5%. Unlike No Impact Man, we were still running our chest freezer in the garage, regardless of the experiment, so this was a true and actual savings, since we run our own freezer year round, and we ran it last year as well. Translation: We saved $0.76 per DAY over what we spent last year! For a month, that’s $22.80 in electricity. Um – math people, correct me, but is that really 33.2% !?!??!?! REALLY!??!?! Whoa. Is it worth it? Um, yes, 33.2% savings over a year in electricity is worth a daily trip to the garage freezer to swap out ice jugs to us! That amount of money would put a decent dent into buying a newer, more efficient freezer (which would really save us a lot more, since ours is from the 1980’s). Will we keep it unplugged? As it stands, Y.E.S.!! Now, admittedly, this is the first week of distribution from the CSA, so we’re not sure how all of that will be handled once the major produce really starts rolling in. I am 35 weeks pregnant, which means I can expect to be less available to handle food preservation duties for a few weeks. But Rick and I make a pretty good tag team. There’s no law that says if the going gets tough (or we’re just plain going crazy), we can’t plug back in to catch up. But I really don’t think that will happen. I will, of course, tell you if it does. Full disclosure here. The plan for now is to keep going without it. Feels kind of liberating, actually! So what do you think? Would you be willing to try it? Any ideas of how we could improve? Do you think it’s worth it? Also, I think I linked to nearly all of them, but just in case, here is the entire series of posts covering our Unplugging the Fridge experiment. Happy reading! On the farm we (now finally) have a freezer. I do the same as you – freeze 5lt (5gall) bottles of water and use them in a cooler box – that cooler box is my fridge, and all the rest of our goods which need cooler temperatures, are kept in the freezer. (http://ecofootprintsa.blogspot.com/2011/04/where-were-all-easter-bunnies-then.html) Also if you do a search of the word “freezer” it will bring up all the blog posts where that is mentioned. I am all for this experiment. I do, however, have a couple of questions/comments, as we would like to build a small cabin in an even more remote place than our house west of Cheyenne. There will be no electricity at all. I am well aware that eggs and produce do not need to be refrigerated, but how do you keep the flying insects away from the produce that is sitting on the counter? When we were in New York, gnats would swarm around the kiwis and softer fruits that I left out to ripen. I do not know if the giant flies or miller moths we have in WY would have any interest in resting on/eating vegetables. Melons can not be eaten in one day. Can they be safely stored in a Rubbermaid in a flower pot fridge? Mice can eat through a cardboard box of pasta. What about a piece of meat in a flower pot? I would love to keep food cold in a nearby stream, but how does one keep the container from eventually floating away from its spot by the current? Or keep it away from bears? When we backpack, we hang the stuff sack up high enough that the bears can’t reach it. How does one handle leftovers? We can certainly freeze food at home before going to the cabin, but it may be defrosted either before or within a day or 2 of arrival. There are laws against hunting out of season, by the way. Anyway, during the 9 months of winter, we can figure out how to keep food cold, it’s the warmer months I am worried about. I think what you are doing is cool and is a wonderful idea. Last year when we were living out of our tent we had no refrigerator to use. We got by on just canned meats and once a month we’d buy fresh meat and we’d buy some ice and have some fresh meat once a month. Now I do have a suggestion, having worked in food service (yuck), I get squirmy over the idea of thawing meats on counters. Also having a couple cats makes that near impossible here. How about you take your meat out before bed and put it in with your milk then it should be thawed enough by the time you need it the next day and no worries about bacterial growth. I know the problem with cats, I grew up with a cat that would have helped herself – but we don’t have one now, since I’m allergic. Okay, I admit to being too sleep deprived to figure this part out, but what is the cost of the energy per therm or kwH compared to last year? And P.S. That reminds me of our “nice melons” photo from the CSA a few years ago. Ok, below are the details from this bill. Someone help me out! Last year for this billing period, we used 537 kWh. The cost per kWh last year is not listed. I’m not sure what the second to last line on the chart I put in the post is saying because it doesn’t make sense to me on how the numbers are working out. ?? Let’s assume the cost last year was the same as this year. Working with just fees tied to the number of kWh (the first six lines, stopping before the Service & Facility fee). For this year that’s $35.38. So $35.38 / 380kWh = $0.09311/kwh. $0.09311 x 587kWh last year = $50.00. $35.38 / $50 = 29.24% savings. Yes? My fridge died on me at the beginning of summer about 2 years ago. We live in Saint Louis with 2 children & it gets over 100 degrees on average here in the summer. I was broke, felt like I was in quite a pickle but wasn’t willing to give up. I found an old school R2-D2 beer cooler in the ally behind my house, bought some ice for a dollar & was able to keep milk, cheese, cottage cheese and more in there. Never had a problem. And the ironic part was the cooler was outside all summer. Granted, it’s not the same situation but my neighbors were willing to help once they realized what I was having to do. They allowed me to use a space in their freezer for my ice containers (which were 20 oz plastic soda bottles). A deep freezer is on our wish list, and once we can afford it we will have one. I liked the method, because I wasn’t finding rotten food in my fridge any longer. I was wasting less food since I was having to buy smaller quantities, yet sill consuming them at the same pace. All in all, a lot of these ‘Applicances’ that we have in our kitchens are simply for convenience (and/or laziness, lol). I definitely think the fridge experiment is interesting and commend your efforts. But I think you’re missing something in your calculations. When you use the freezer to refreeze milk jugs every day, that means the freezer has to work a little harder than it would just keeping meat, etc frozen. You don’t get that freezing energy for free. Assuming you’re using the freezer more or less the same as you did last year, except for the addition of refreezing the milk every day, you’re using more energy. It could be that your freezer is more efficient than your fridge, so maybe you’re still getting a savings (in energy and dollars). But until you get the numbers for how much more energy your freezer is using (and it must be), you don’t have an accurate measure of the net effect of unplugging your fridge. P.S. Sorry if this has already been brought up. Thanks for bringing it up – not sure if it’s really using a lot more energy, since one, the freezer is nearly full as is, and two, the jugs are only about half way defrosted? Plus we open it nearly every day anyway to get things from it. Possible though, I’m sure. I think a Kill-A-Watt or something would come in handy to check this, but seeing the wattage used on my energy bill is showing less energy usage overall. Even if the freezer is working slightly harder, we are still saving a lot more to make up the difference. I find this to be pretty intriguing….enough in fact that I wish you would go to my blog and link this post up to my Frugal Friday’s linky! I’m going to go read the previous mentioned posts as well. At this point, saving any kind of money is a Godsend. We, too, have a deep freeze. It’s just one of those smaller square ones, but money wise, we just barely keep anything in it. Most of what we use is in the freezer of the fridge. In other words….we too could put what’s in the fridge freezer into the deep freeze, and use the fridge freezer for keeping fridge things cold with frozen gallons of water! Interesting. Hubby and I have been shopping around for a much smaller fridge that is more energy efficient to replace our perfectly good, but huge energy hog and renovate our kitchen around it. So far we’ve found smaller, OR energy efficient, but not both. Considering how little we store in our fridge, the amount that we grow and consume fresh, and how efficient our big freezer in the garage is, we could absolutely unplug ours completely and be fine. I have heard however that fridges that remain unplugged and closed can build up toxic gasses inside, so I wouldn’t want that sitting in my house, but I can’t exactly design a kitchen with no fridge at all in a house that we will end up selling down the road. Does anyone else who has simply unplugged theirs worry about the gas buildup? Love your experiment, thank you for sharing this and the results! We have two energy effecient fridges, and a full freezer. That saves us time and money; I shop once every two months and hubby will grab bananas and milk when needed. I have been a stay-at-home mom for 20 of our 30 years of marriage. 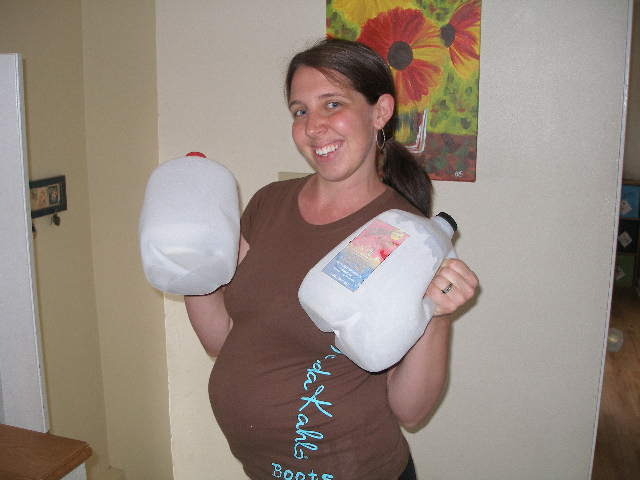 We have had to go without electricity before for a variety of reasons, and I never thought of the chest cooler with gallon jugs of ice before; that is a whopper of a great idea!! Going to employ this as soon as I get the space in my freezer for this (filling it with blueberries from our backyard bushes right now). Once we are empty-nesters we may find another use for the second fridge ( as it will be 16 years old by then) and know we will save plenty, unless we have solar power by then! Blessings! Several years ago, our refrigerator was not working and we did not have an ice box or chest freezer. Fortunately (Deo Gracias! ), that was also the worst winter we had! I dragged the fridge to my back porch and surrounded it with snow (except for the opening). Then I had the kids build snow bricks and shape them into the grocery bags I had from the store. These bricks were what we stuffed into the fridge to cool everything in there. I also took several of the plastic bins/tubs that I had and brought them outside too. I did the same thing and used them as mini freezers to keep the frozen meats frozen for as long as I could, instead of putting snow inside, though, I buried the bin in snow, and made snow bricks in bags that I could easily lift on/off when I wanted to open the bin. This proved to be an experience God sent us for Sandy (the hurricane that hit the NY area last October). When the storm predicted power outage, I stocked up on ice bricks that I made in my freezer (I have one now! ), and used them for my fridge to hold milk, cheese, yogurt, etc. When I ran out of ice bricks, I dragged my food outside at night, where it would practically freeze our food, then drag them in and try to cook them off and feed them to everyone in the day. The freezer food was marinated, salted, and cured to last and was stored on the roof (away from possible animals). The important thing is that we already had experience dealing without a fridge, so everyone, even the kids, were able to shift gears easily, and there was no emotional upheaval. After all I have gone through in the last few years, I realized that these kinds of experiences become so traumatizing because of the emotional attachment we have to this convenience-driven lifestyle we have. We think we cannot or will not survive without ……..(you fill in the blank), but honestly, God does not send us trials he know we cannot prevail against.